$349.95 (USD) for a 3 Year License. Designed for Electronic Discovery and Forensic. 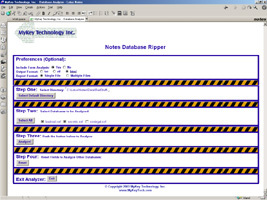 Notes the Ripper is a computer forensic and electronic discovery tool that quickly and safely analyzes and extracts data from Lotus Notes® NSF files. Lotus notes stores all of its data, including Email files, in NSF files. The traditional analysis technique is to open an NSF file in Lotus Notes and manually scan and extract every document. Obviously, this is a time consuming process. Notes the Ripper automates this process. Simply select the files to be analyzed, select a directory to store the results, and let it rip. Notes the Ripper extracts all of the documents, forms, and even file attachments from each NSF file. The format of the report is selectable from ASCII text, Rich Text Format, or even HTML. The report may be saved as a single file, or as one file per document, with a master index. For the HTML option, the master document includes hypertext links to all of the files extracted from the NSF file. Notes the Ripper creates a Master Status Document containing the results of the ripping process. This document contains information about all of the files processed, including information about any files that could not be processed. There are no distracting dialog boxes to OK while processing multiple files, and no user intervention is required during a run. Should a file not be able to be processed, for whatever reason, information about the file and the possible cause of the failure will be noted in the Master Status Document. Analyzing an NSF file through Note the Ripper provides an extra layer of safety over trying to open an NSF file directly. An NSF file may be programmed to self-destruct if opened directly in Lotus Notes. 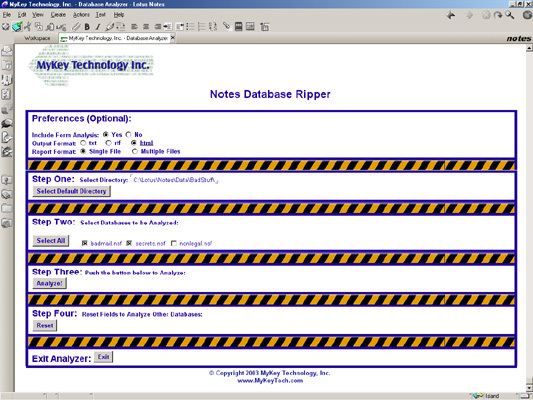 Notes the Ripper bypasses the normal opening process and can safely analyze even such booby-trapped files. Notes the Ripper is not a password cracking program. Certain notes documents may be encrypted and require a password. Notes the Ripper cannot open these files, but will document the fact that they were not processed in the Master Status Document. Similarly, there are some documents that can only be opened if Notes is running with a specific user ID and its associated password. Attempts to analyze such documents may fail, and this will be noted in the Master Status Document as well.